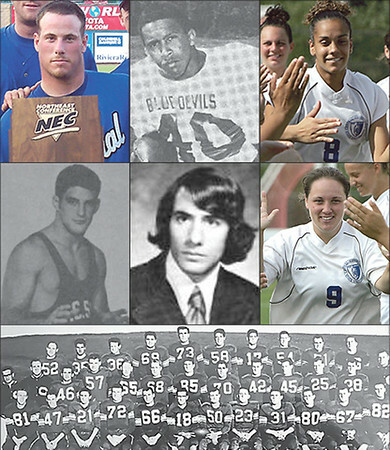 The Central Connecticut State University Alumni Athletic Hall of Fame is getting ready for its 40th anniversary. The Hall of Fame will induct six former student-athletes and the undefeated 1954 football team on Friday, May 3 in Alumni Hall on the CCSU campus. The Hall of Fame began in 1979. The Class of 2019 includes, Tim D’Aquila ’05 (baseball), Harold Brown ’78 (football), Juliana DiPlacido ’06 (soccer/swimming & diving), John Hamilton ’74 (wrestling), Robert Lees ’74 (track, cross country), Kelly Shimmin ’04 (soccer) and the 1954 football team. D’Aquila was a three-time All-Northeast Conference performer for the Blue Devils, earning league Player of the Year (2003) and Rookie of the Year (2001) honors during his career, as well as being named an All-American and All-New England performer. He is still the program’s all-time leader in hits (288), runs batted in (185), doubles (51) and ranks in the top-10 in batting average, runs scored and triples. D’Aquila helped CCSU win three straight NEC titles, including 2004 when they won a program-record 41 games. Brown was a star running back for the Blue Devils football team from 1966-68. He earned Associated Press All-America Honorable Mention and AP All-New England Honorable Mention honors in 1967 when he helped CCSU to a 7-1 record. Brown also was a member of the All-ECAC Division III and All-Eastern Football Conference Team. He ran for a then school-record 1,079 yards in 1967, which included a 254-yard game against AIC, also a record at the time. DiPlacido was a standout for the Blue Devils in two sports, earning All-Northeast Conference honors. On the soccer field, DiPlacido was an NSCAA All-Region, Soccer Buzz All-Northeast Region and All-NEC First Team performer in 2005. She was also named the CCSU Player of the Year that season. On the swimming & diving team she was named the NEC Outstanding Diver from 2004-06 and earned all-conference honors in both the 1-meter and 3-meter events. She won both events in consecutive seasons from 2003-06. Hamilton was a leader for the Blue Devils’ wrestling team, serving as a two-time team captain. He capped his career at the 1974 NCAA College Division Championships by placing seventh at the 126-pound weight class to earn All-America honors. Hamilton placed second at the New England Intercollegiate Wrestling Tournament in three straight years from 1972-74 and was named to the 1974 edition of “Outstanding College Athletes of America.” He went on to a successful career as a high school coach and administrator on Long Island. Lees was a decorated runner for the Blue Devils’ track & field and cross country teams. He earned All-America honors in 1973 after placing second at the NCAA College Division Track & Field Championships in the three-mile run. Lees, who set multiple school records, also finished third at the prestigious Penn Relays in 1973 in the three-mile run. A five-time All-New England performer in cross country and track & field, he set the New England record in the two-mile run in 1973. Following graduation, Lees went on to a distinguished 27-year career in the U.S. Army and retired with the rank of Colonel. Shimmin was a two-time Northeast Conference Player of the Year (2002-03) and earned Soccer Buzz Honorable Mention All-America honors in 2003. The Gail Rutz Award selection as a senior, she earned NEC Tournament MVP honors in 2004 and All-NEC First Team honors three times. Shimmin helped CCSU to three conference championships and she set the school single-season assist record (16) and scored 38 points in 2003, which ranks second on the single-season chart. Her career marks of 108 points, 40 goals and 28 assists ranks second on the program’s career list. The 1954 football team was led by head coach Henry Majlinger and captained by CCSU Alumni Athletics Hall of Famers Ray Rondini and Lou Magnoli. In just his second year as head coach, Majlinger guided the Blue Devils to a 6-0 record. The team featured multiple Alumni Athletics Hall of Famers and was led by a stout defense that was only scored on four times and outscored its opponents, 158-26, in six games. The team had a pair of All-State First Team selections: Paul Amenta, who was a standout at tackle, and Bob Skinner, who scored 48 points to rank second in the state. Ernie Sutkowski averaged a team-high 7.0 yards per carry and Bob Skinner led the team in scoring. Posted in New Britain Herald, CCSU on Tuesday, 9 April 2019 18:23. Updated: Tuesday, 9 April 2019 18:26.